The bonito fish actually has many names in the Atlantic and Gulf: the Atlantic Bonita, the Northern Bonito, the Common Bonito, and the Oceanic Bonito. A small and streamlined tuna and a member of the mackerel family, bonitos are more common in deep sea, but warm, Atlantic waters and don’t make it into the Gulf much. Unlike its larger tuna cousins, the bonito has longitudinal lines (stripes) on its back. 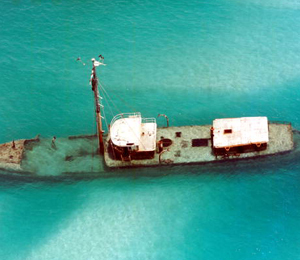 The back and upper sides of the bonito are colored a steel blue. The fish start hunting for prey as soon as they hatch, eating just about all types of fish, such as hake, menhaden, mackerels, anchovies, herrings, even shrimp and squid. Atlantic bonito often can be seen swimming in large schools, often with mackerel and bluefish. Bonito usually range in size of about two feet in length and weigh about four to five pounds, although they can reach 12-15 pounds rarely reach more than 20 pounds. 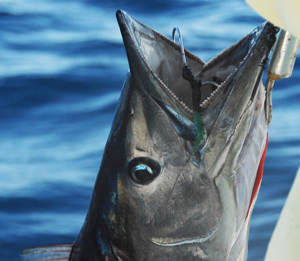 Bonito found offshore tend to be larger, in the 12-15-pound range. Unlike their larger cousins, the tuna, bonito aren’t very tasty to eat. Their meat is very bloody and has a very “fishy” taste. Blue Marlin Fishing Charters in Key West Because of their smaller size, you don’t need large tackle: a 15- or 20-pound tackle should do. 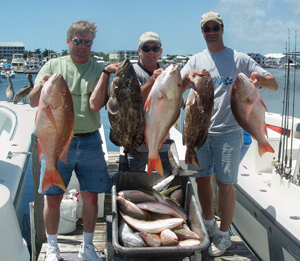 You usually can catch them with either bait or lures. If you’re going to use a lure, use something silver that provides a lot of flash. Consider using a Rapala-type plug for trolling. You’ll want to use a steady retrieve with a variable lure (ex: the Krocadile). Conversly, you also could use a variable retrieve with a steady lure (ex: the Yo-Zuri Crystal Minnow). Bonito also will be attracted to your boat with chum; they’re not shy. 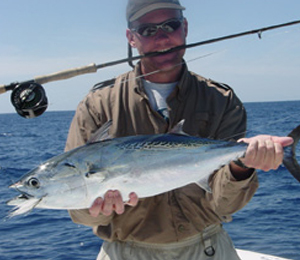 Bonito are quite energetic and acrobatic once caught, especially as you’re trying to remove the hook, so be careful. You can calm them by holding them sideways upside down. If you’re planning on landing and releasing, wear gloves; your bare hands will take off some of their protective slime coat.